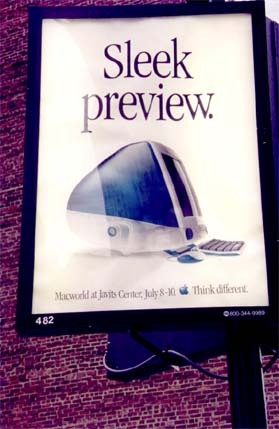 July 1998 saw something new: the East Coast edition of MacWorld Expo moved to the Jacob K. Javits Convention Center on the island of Manhattan. The alleged inspiration for moving from Boston, the usual haunt, was an effort to "reach out" to the publishing and advertising industry concentrated in New York City. This effort seemed to meet with some success -- the average MacWorld attendee was at least better dressed than usual -- but the Expo organizers announced that next year the show will move back to Boston. MacWorld Expo security personnel insisted that "your film will be seized" if pictures were taken inside the exhibit hall, so -- we didn't take pictures in there. But we did wonder what they'd do if you took pictures with a filmless digital camera.